Synopsis: Celaena has survived deadly contests and shattering heartbreak―but at an unspeakable cost. Now, she must travel to a new land to confront her darkest truth . . . a truth about her heritage that could change her life―and her future―forever. Meanwhile, brutal and monstrous forces are gathering on the horizon, intent on enslaving her world. Will Celaena find the strength to not only fight her inner demons, but to take on the evil that is about to be unleashed? My Review: This book took me a little longer to finish but I finally did it and it was totally worth the journey it took to get to the end. I could not put this one down and every chance I could get I picked it back up to read a little more. This story is so much more than just a story. Its where the tide turns for all of the characters and you read this one at the edge of your seat. 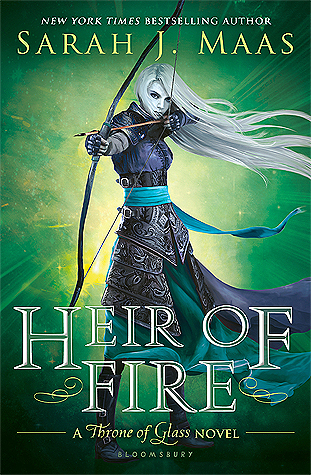 It is full of twists, some gore, and depth and as I reached the end was why this is an epic fantasy!! I really loved how we got more than one story in this title. The introduction of Manon Blackbeak was brilliant and exciting and gave this book the edge to make it amazing.